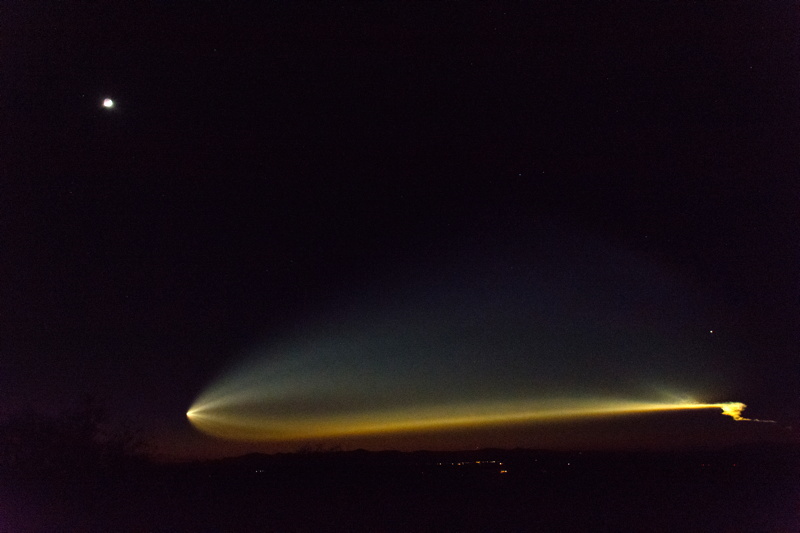 Cassiopeia Observatory - Report - SpaceX Falcon 9 California Launch seen from Arizona! 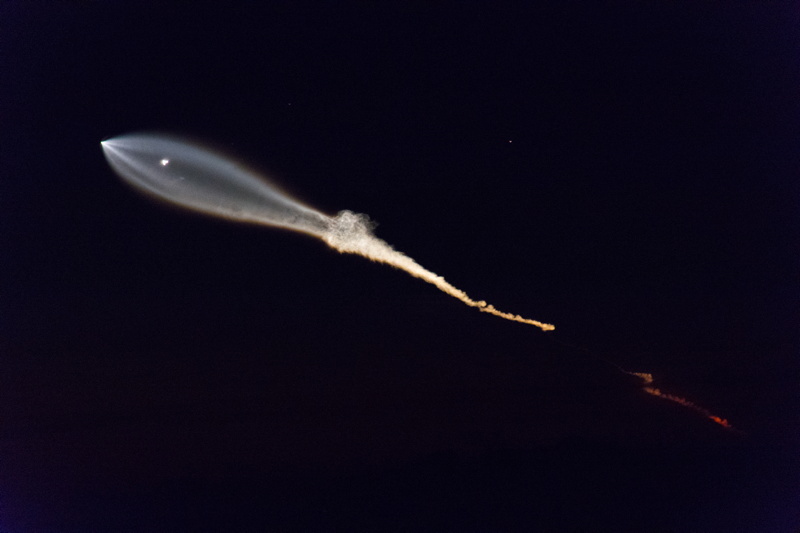 SpaceX Falcon 9 California Launch seen from Arizona! The sky became overcast about sunrise on Thursday, 21 December 2017. Must have been some magic clouds as the forecasts were for clear skies all day. Mid-day the sky began clearing but the wind picked up. I did some work in the observatory during the daytime. Shortly after sunset the temperature was down to 37°F and rapidly dropping. As I was still getting over the flu I decided to be smart and skip opening the observatory that night. 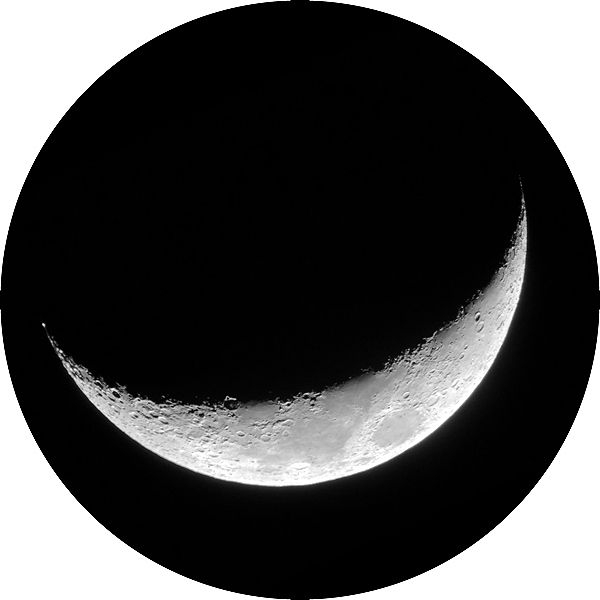 Friday, 22 December, was mostly clear, the temperatures were not as low as on the previous night, and I was feeling a little better. 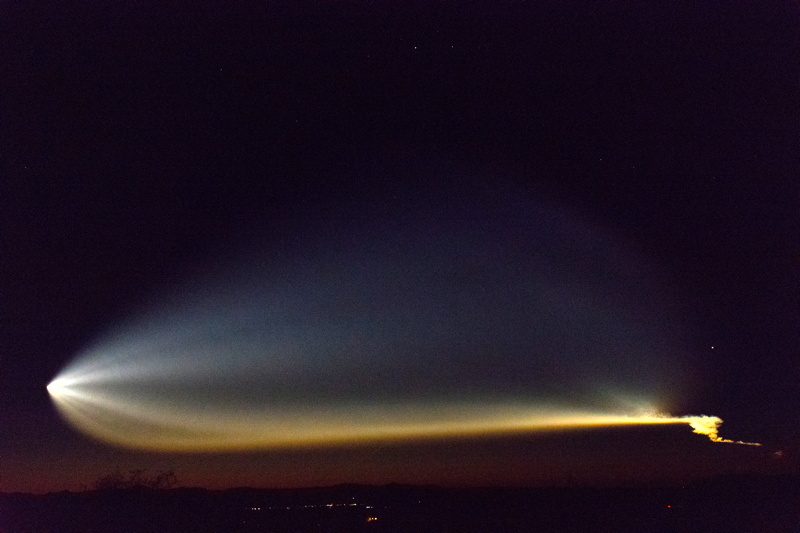 And there was a SpaceX Falcon 9 launch from Vandenberg Air Force Base in California to try to see after sunset. I then left the observatory and went to the front entryway of the house, which is at a higher elevation and has a clear view of the western horizon. This would allow a good view of the launch of the SpaceX Falcon 9 rocket from Vandenberg AFB. 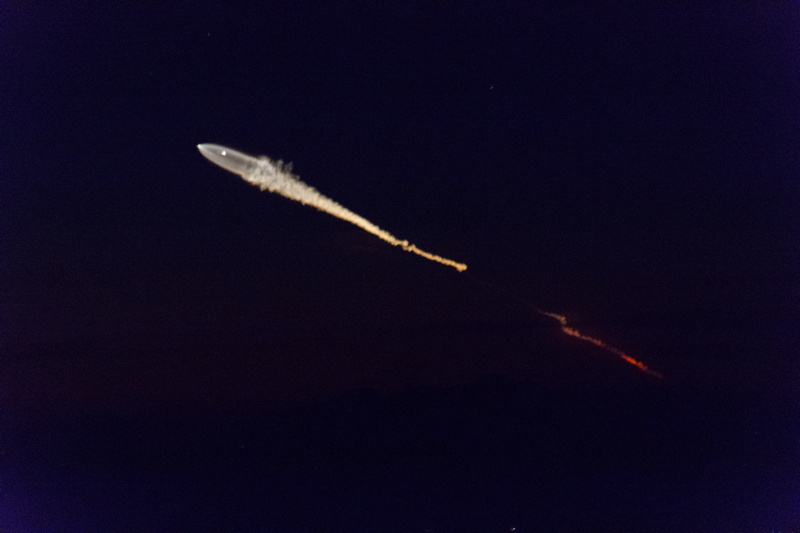 And as you can see from the following handheld photos taken with the D7200 DSLR at various exposure settings and decreasing focal lengths as the rocket plume expanded, the sight was awesome. The first photo shows the first stage powering the launch. The next four photos show the second stage rocket with the first stage falling away. An airplane appears at the right. 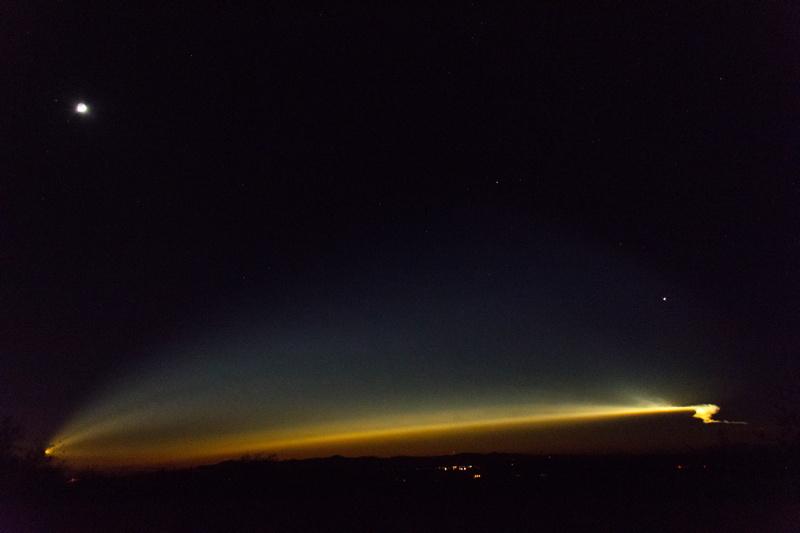 The last two photos show the crescent Moon at the upper left with the western horizon fully visible. 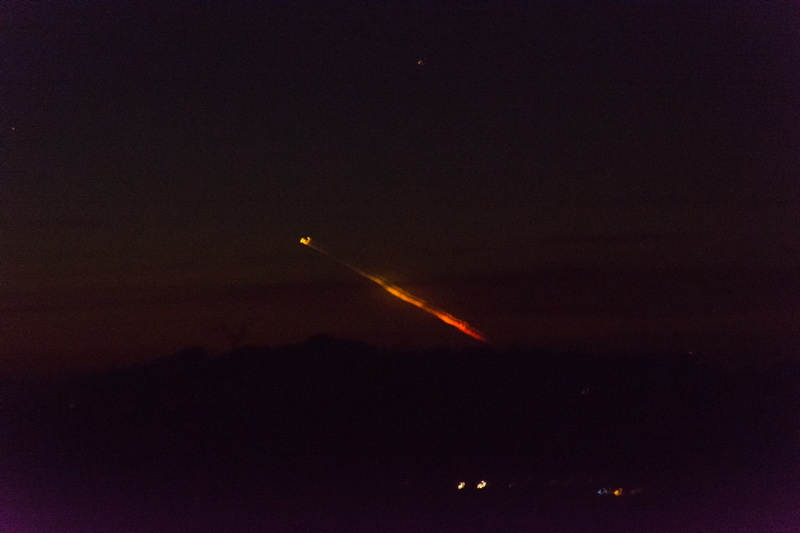 Those photos demonstrate the size of the rocket plume as seen from Arizona. The next time there is a sunset launch from Vandenberg I will try to get a video. 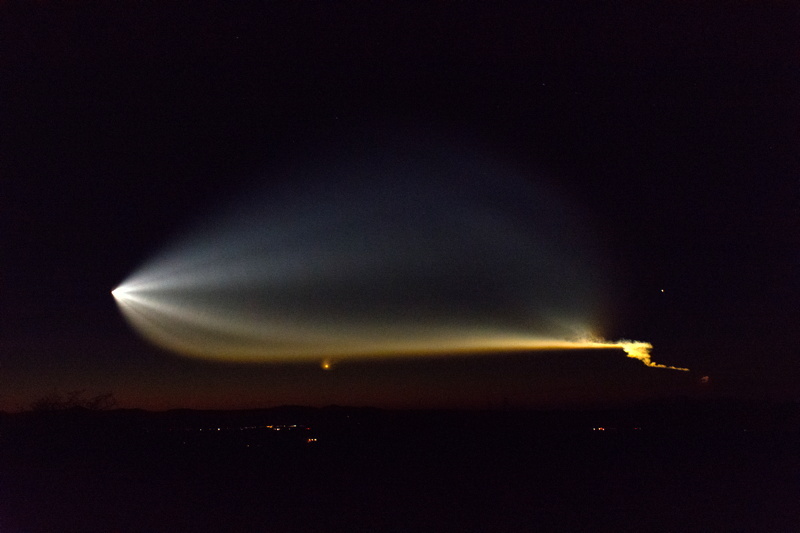 When we lived in southern California I saw and video recorded some missile launches from VAFB, and the view was impressive. But I never expected to see such a sight after moving to Arizona. 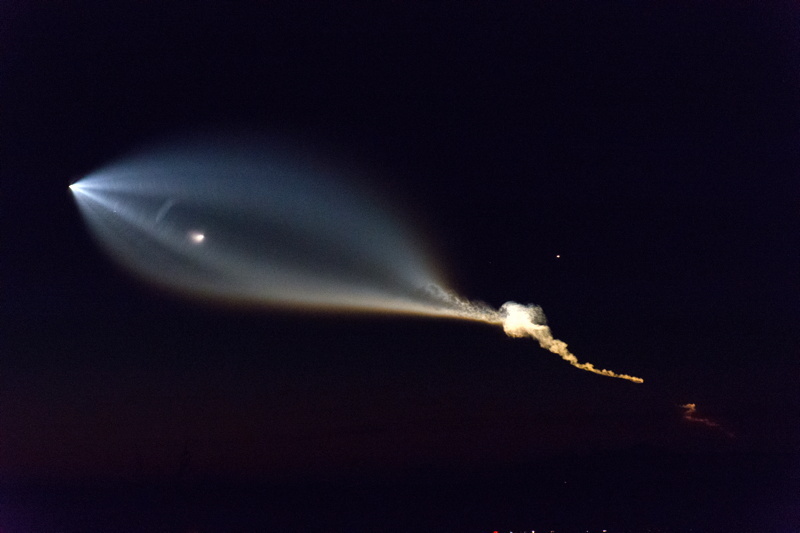 Thanks SpaceX! Once the Falcon rocket disappeared from view as it descended towards the southwestern horizon, I returned to the observatory. Then viewed M1 (Crab Nebula), 102X. Next, I did some needed things in the observatory prior to closing up. Glad it was not as cold this night, but my writing pens had stop working due to the low temperature by the time I closed up for the night. A newspaper has published a short article about my talk to some local 4th graders: Astronomer visits Mt. Vista School.